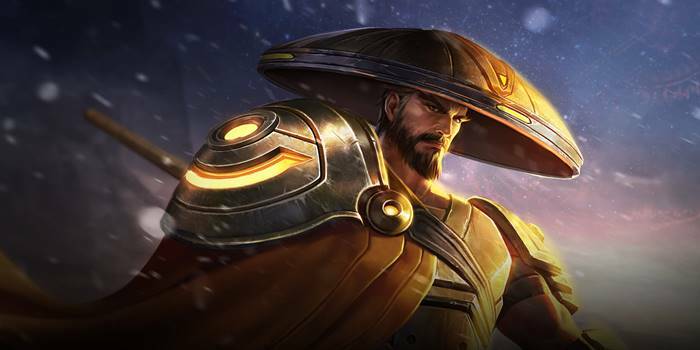 A guide to Arena of Valor's Ryoma, the Ronin. Ryoma uses his Naginata to pierce his enemies' defenses, delivering swift combos to route any who step up to him. Ryoma is an offensively focused warrior assassin proficient at wearing down opponents with a mastery of his naginata. He is able to provide large amounts of lane pressure and harrassment as well as burst down low health heroes with his abilities. Excellent Poke – Ryoma’s abilities allow him to effortlessly harass his opponents. His Pinwheel + Wailing Blade combo deals a good amount of damage as well. This is particularly deadly against low health heroes like mages, assassins, or marksmen. Great at Pushing and Pressuring – Each of Ryoma’s abilities is able to damage multiple enemies. This makes him good at pushing, especially when using Wailing Blade on minion waves. Oftentimes, his efficiency at pushing will force the enemy team to give his lane a lot of attention, which in turn gives your teammates an easier time with their own lanes. Decent Range – Ryoma’s Abilities give him some level of versatility against enemy heroes by allowing him to attack from a distance. For instance, Pinwheel is a deceptive ability that gives Ryoma a chance to dodge enemy attacks and slash them at the same time. He can then follow up with Wailing Blade to stun while damaging the enemy further. Requires Precise Positioning – Ryoma’s Naginatajutsu and Wailing Blade abilities do additional damage to enemies at the edge of their range. In contrast, his ultimate is easy to escape when used at a long range and Pinwheel can take you outside of attack range before a fight is finished if used carelessly. It takes practice to get used to positioning Ryoma in a way that lets you best use his abilities. Struggles when Kited – Being a melee hero, Ryoma can run into trouble when facing ranged heroes, particularly marksmen. Skilled marksmen are keen on Ryoma’s abilities and can evade his pokes while dishing out damage in return as well. Focus on farming in order to get your items quickly. When an enemy is in range, harass them with Wailing Blade or Pinwheel. Remember to harass whenever your Naginatajutsu is available so that your Wailing Blade + normal attack combo does more damage. If your team is not looking for a team fight, make it a point to push a nearby lane. This will pressure the enemy team into addressing the lane while your team can set up a clash. Use Spectral Ire on nearby monsters in between waves in order to top off your health without returning to the base. Level up and max Wailing Blade first. This will be your main poking ability. Next, get Pinwheel so that you’ll have a means to get out of unwanted skirmishes as well as a way to set up Wailing Blade’s stun. Finally, get Spectral Ire whenever you can. This ultimate allows you to deal burst damage to stunned opponents and heal yourself. Solo Battle: Start by nailing the enemy with Wailing Blade, hitting with the tip in order to stun them. This will open them up for a follow up with Naginatajutsu. Continue with Spectral Ire, ripping away what remains of the enemy’s health while refreshing your own. Pinwheel can then be used either to retreat or to position yourself in preparation for the fight to continue. Team Battle: Coordinate with your teammates whenever you want to start a team fight. It is best to have an initiator engage the enemy and try to stun as much of the opposing team as possible. Aim for the back line in order to take the damage dealers out. Keep moving to avoid drawing too much enemy aggression. Escaping Battle: Cast Pinwheel toward your opponent to cause you to jump back in the opposite direction. You can also use Wailing Blade first to stun the enemy heroes who are chasing you before casting Pinwheel to escape. Naginatajutsu – Passive – Every 5 seconds, Ryoma’s next normal attack unleashes a shadow blade that has a longer range and deals (+1.2 AD)ˀ physical damage and reduces enemy movement speed by 50% for 2 seconds. Enemies hit by the shadow blade at the outer border of the range will suffer an additional 50% physical damage. Naginatajutsu gives Ryoma good pushing and dueling power, since it empowers his normal attack whenever it is available. Line up your attacks in lane to hit both the targetted minion and the opposing hero. This will allow you to freely harass the enemy while farming. Pinwheel – Ryoma leaps backwards while extending his naginata, dealing 250/300/350/400/450/500 (+1.25 AD) physical damage to surrounding enemies. If Ryoma damages an enemy hero, then Pinwheel’s cooldown is reduced by 3 seconds. This effect is not stackable. Use Pinwheel to evade heroes who engage you with their dash abilities. This is an effective way to cause them to miss their ability while damaging them as well. You can combo Pinwheel with Wailing Blade, Pinwheel’s jump putting you in position to hit your target with Wailing Blade’s maximum potential. Wailing Blade– Ryoma unleashes a 350/395/440/485/530/575 (+2.1 AD) physical damage that deals physical damage to the first enemy and 50% damage to subsequent enemies it hits. Enemies hit at the outer border of the ability’s range will be stunned for 0.75 seconds. Wailing Blade is your main damage ability apart form Spectral Ire. This Ability allows you to push your lane faster, as well as provide some utility during skirmishes and team fights thanks to its stun. Wailing Blade can be combo’ed with Spectral Ire for massive damage. This is especially deadly during team fights and the opponents have been disabled by your teammates. Spectral Ire – Ryoma furiously stabs with his naginata, inflicting up to 4 instances of damage on enemies. Every hit deals 130/180/230 (+0.7 AD) physical damage. For each stab that hits an enemy hero, Ryoma regains 70/100/130 (+0.35 AD) HP (no additional HP gained for hitting multiple enemies with one stab). Spectral Ire deals massive damage to enemies who are stuck in its effect. As such, coordinate with your team so that they can initiate and stun opponents. Afterward, cast Spectral Ire as to hit most of the disabled heroes. During skirmishes, Ryoma’s standard ability combo starts with Wailing Blade + Spectral Ire + normal attack with Naginatajutsu, finishing with Pinwheel. Non-hero targets that are hit will also restore HP at half the rate of a hero target. Use this to regenerate in between minion waves. Goad Ryoma into diving into you. Once he goes all in, disengage and punish him with a hard crowd control ability to thwart his ability combo string. Ryoma is squishier than most warriors and thereby much more vulnerable to being burst down. Ryoma does well when running an offense-heavy Arcana set. This usually comprises of Onslaught, Assassinate, and Skewer which grants him good AD, Armor Pierce and Movement Speed to complement the damage of his abilities. Ryoma generally does well against tanks, especially if he is able to whittle down their HP with his strong pokes. However, he might struggle against tank heroes who have hard control abilities since he won’t be able to pull off his combo as reliably when stunned or slowed. Ryoma does pretty well against warriors, most of them melee and thereby needing to get up close and personal to deal damage. He is particularly good when it comes to baiting enemy warriors into using their abilities, evading with Pinwheel, and then punishing them with Wailing Blade and Spectral Ire. Ryoma is strong against assassins. Since most assassins rely on getting close to their targets, Ryoma players can react by jumping away with Pinwheel before stunning them with Wailing Blade. Once he manages to stun the opposing assassin, his Spectral Ire and normal attacks should be enough to finish them off. Ryoma makes quick work of mages as most of them are rather squishy. If Ryoma can get close to the enemy mage and land his combo, he’ll oftentimes end up with a kill. That said, experienced mages who have movement inhibiting abilities may be able to keep Ryoma at bay and pelt him with their damaging abilities. Ryoma’s ability to deal with marksmen depends on how the game progresses. Ryoma can struggle against experienced marksmen even if he dukes it out and plays the poke game. But just like with mages, once Ryoma gets close or manages to disable the opposing marksman he will be able to make quick work of them. Ryoma is decent against squishy supports. However, he needs to be wary of control abilities that the support may possess. Ryoma gets into trouble if he is not able to pull of his combos.